Even Bad Habits Don’t Deserve to be Kicked! The spacious mind that arises out of the regular practice of meditation is a perfect stage for noticing a self-destructive behavior, and then noticing the voice inside us that activates or instigates that behavior. This noticing and listening is much more effective than trying to strong arm ourselves into stopping the behavior. How many times have you quit smoking or gone on a diet only to sabotage yourself? This is clearly a painful self-destructive pattern. Each failure makes us feel like a failure. Each hope dashed lowers our view of our own abilities. Remembering when we have been successful at changing a behavior, we also remember a feeling of being whole-hearted, of being completely clear, and that it felt as if the change came about naturally. That sense of wholeness and clarity allows for positive change. Otherwise, the thundering roar of a cacophony of conflicting inner directives – desires, urges, fears – may totally derail us. The clarity comes from all the inner voices being in tune and in harmony. All our inner aspects need to be on board before a real shift can happen. If we are really noticing, we find that on every journey to an unskillful action there is a conversation between inner aspects. At first we may notice only the most urgent voice demanding that cookie right now. The urgency is uncomfortable or exhilarating, and it may feel like our only choice is to comply. But when we pay closer attention, we find there is at least one other voice as well. If we recognize that the urgency doesn’t necessarily require immediate action, that we actually can tolerate ‘listening to the inner baby cry’ a bit before responding, we might begin to hear another voice as well. There is a quiet voice within each of us that we may never notice until we are really paying attention. The silence of meditation allows us to become aware of a calm inner spacious wisdom. 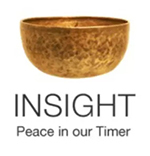 Through the regular practice of meditation, we can seek this wise inner resource out, as I did in my book Tapping the Wisdom Within, A Guide to Joyous Living. As we begin to listen to this inner wisdom, we can allow it to have loving diplomatic conversations with our other aspects, negotiating inner peace. We can shift the internal power structure so that the urgent caffeinated aspects that have been yelling so loud that we give them what they want just to shut them up for a while, are no longer calling the shots. At first it may be hard to find that wise inner voice, mostly because our more rambunctious aspects are running the show. But with regular meditative practice, quiet walks in nature, setting the intention to stay in the present moment and be kind, we create a spaciousness that allows us to notice and listen with curiosity. With that spaciousness, our journey of self-discovery truly begins. Any self discovery we have done in the past, without this spaciousness, is more likely to have been a grabbing at identity clues and claiming them. I am that, I am like that, I am that kind of person. Our discoveries may be interesting or comforting, but really they are just decorative accessories of identity. The self-discovery we embark on through this meditative practice is not a grabbing identity as if our behaviors or preferences are life preservers to save us. Often it is our attachment to a certain identity that causes us and those around us suffering. My mother died of emphysema. She said she could have quit smoking much sooner, but she was so sure she would be an incredibly boring person without a cigarette in her hand to make her glamorous! Those artful smoke swirls of 1930’s movies had done their number on her. Of course when she finally quit she was even more interesting and enjoyable to be around. A good question to ask ourselves when we are wanting to quit a habit but are finding it impossible: Who would I be without my cigarette? or Who would I be without my sweet treats? or Who would I be without my quick temper? The answers may set us on a fruitful journey of exploration. Perhaps you have known a child whose room is piled high with all manner of garbage – discarded soda cans, gum wrappers, etc. – and they refuse to acknowledge this is trash. What’s up with that? Perhaps they are desperately building an identity for themselves, and everything they have touched defines them. So throwing away the soda can is for them throwing away a bit of themselves. This is an extreme example of something we all do to varying degrees. We take pride in our choices of the objects we have chosen to fill our lives, and vest them with the power to define us, to represent us to the world and even to ourselves. We can be very rigid in our definition. I would never wear that! I hate that kind of food. I’m the kind of person who lives in this kind of house, decorated in this particular style. I can’t imagine myself in a different setting. All of these kinds of statements are not just preferences, they are the life preservers of our identity, and we cling to them pretty fiercely. When we come into a vaster vantage point of Right View, we begin to see that none of these things are us at all. What is offered is much greater than all of this little detritus floating around in the sea that we’ve been clinging to for dear life. It is the invitation to recognize that we are the sea itself. We don’t need life preservers of identity to rescue us. We are already rescued! We only need to recognize our true nature. Notice the little voice in you saying, But I want the cool things! This is not about giving up the things. It’s about shifting our relationship to them and the world around us, not believing that these things define us. And then not being attached to the identity of being a person who can do without things. It’s an ongoing process! If you are not yet ready to give up the life raft of identity, don’t fret. Don’t add yet another voice to the cacophony within that says you haven’t got it. Baloney! You’ve got it. It’s all there. In your own time, in your own way, at your own pace, you will reveal all to yourself. Patience. Practice. Intention to be present in this moment and to be kind. Let that be absolutely enough. It truly is. – The patience to stay with the thought a while before fulfilling its demand through action. – The ability to see that the thought has a voice, an agenda, an intention that may be rooted in fear. – The skill to negotiate a workable solution that circumvents the unskillful behavior it requests, while fulfilling the deeper need for a sense of safety and security that it desires. Listening to the voice that is promoting the behavior, naming it, asking questions, negotiating some equitable solution. Voice by voice, we get ourselves together, speaking with one clear intention. That’s when resistance to the change we want to make falls away. We haven’t ripped it out, we haven’t thrown any part of ourselves away, we haven’t sacrificed anything. We have simply made friends with ourselves and become whole-hearted and able to do what we need to do. This entry was posted in addiction, habit, http://schemas.google.com/blogger/2008/kind#post, inquiry, quit, self-destructive behavior, spaciousness, Wise Action on March 26, 2009 by Stephanie Noble.